While cutting back on project communication can add short-term advantage and time saving, it will create long-term problems. Constant, effective communication among all project stakeholders ranks high among the factors leading to the success of a project. It is a key prerequisite of getting the right things done in the right way. 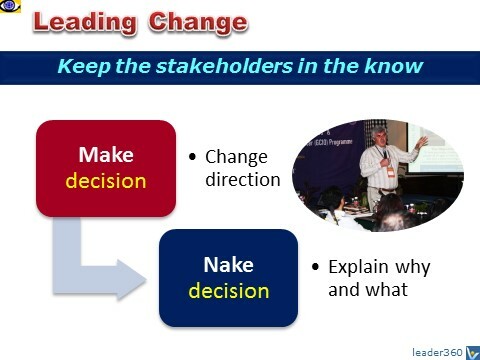 As knowledge is power, sharing knowledge empowering every project stakeholder. A project communication plan is the written strategy for getting the right information to the right project stakeholders at the right time. Each stakeholder has different requirements for information as they participate in the project in different ways. Preplanning can reduce the work of communication. For instance, you can distribute lists for standard materials such as project updates, or set up a project "war room" with a bulletin board. For information to be used, it has to be delivered to its target users timely. As a project manager, while developing your communication plan, you need to decide how often to contact each stakeholder and with what information. Develop and maintain project visibility room and other displays of project information for easy reference by the project stakeholders. Authorization information - decisions made by customers, sponsors, and upper management - that relates to the project and its business environment, and enables the team members to keep all project decisions synchronized. Internal communications happen primarily through team meetings, memos, voice mail, and e-mail. Project managers need to be able to write, speak and listen well, lead meeting and resolve conflicts effectively. External stakeholders, such as sponsor, customer and resource manager, must be kept informed of progress and their inputs solicited. "The communication plan should detail the strategy not only for informing these stakeholders, but for actively managing their expectations as well4". Who needs information, why, and when? What type of information will they need and in what detail? What will you goal be when you communicate with customer and management and what medium will best accomplish that? Every component and every stakeholder in your project, however a minor role he or she may play, is important. Even minor role players have the potential to come out large if they fall behind schedule, eventually affecting your critical path. So, don't make the mistake of assuming that all players outside your department or your company, nominated as contact persons, are already on board psychologically. Be proactive in making them a successful part of your project through making personal contact, establishing some rapport face to face, asking for their help, providing them with all necessary information timely, and sending thank-you notes acknowledging their level contribution to them personally and their supervisors. Set up an Escalation Procedure for rapid communication with upper management when a project begins to run over cost or schedule, or rapid decisions need to be made in response to internal or external changes. This escalation should determine which level of upper management to contact depending on the degree of variance from the project plan4. present a → learning opportunity. Formal acceptance of the final deliverables by the customer signifies that the project is complete. The lessons-learned report presents opportunities for → improvement of both your project management process and your personal skills.